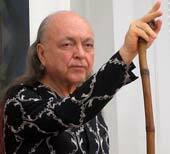 As the years have passed, I understand a little more about that first sighting of Avatar Adi Da. Even as the mind continued to puzzle itself about who Avatar Adi Da was or was not, my heart, the core of my being, had no such dilemma — it recognized that the answer to all my questions and all my heart's yearning sat before me. I saw, in person, the living demonstration of that for which I had longed all my life. I have never been the same since that moment. I had been transformed as suddenly and as irrevocably as Ebenezer Scrooge on Christmas morning. Ever since then, I can freely confess from my own experience that the Divine Being, the inmost Heart of all beings and of all manifestation, does exist, and was, beyond all comprehension, and human understanding, shown alive in the Person of Avatar Adi Da Samraj. That certainty was imparted directly to my heart, beyond the possibility of doubt. I can likewise confess that the Transcendental Spiritual Blessing that is freely given in Avatar Adi Da's Company is the cool water that fully quenches the burning human heart's anguished thirst. I write this story as an invitation to you to likewise consider the possibility of this Liberating relationship, of taking up, in other words, the Way of Perfect and True Happiness that Avatar Adi Da Samraj Reveals, and, in fact, Is.